Over the last couple of months, as stocks swayed and concern over the prospect of a recession ensued, the labor market was relatively steady. 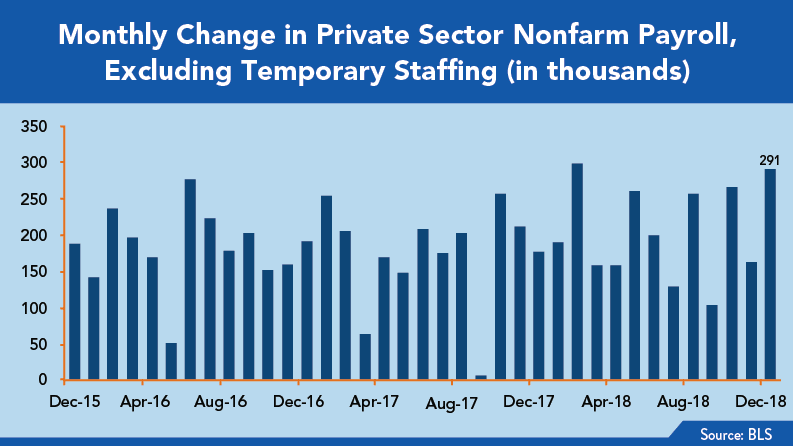 The volatility we have seen in the professional staffing sector may specifically be due to a perception that a slowing economy could significantly loosen up the supply of skilled labor. Overall, employers added more jobs in 2018 than they did in 2017, though last year was unique because Congress passed a big corporate tax cut that accelerated an already strong economy. This new bill caused optimism among consumers and businesses to soar. Manufacturers and builders kept hiring despite trade tensions and a slowdown in the housing market. Wall Street got used to eye-popping job growth numbers. Even if hiring tempers in the coming months, it doesn’t mean that anything is wrong, it just means that we are heading back to normal. As Chief Corporate Development Officer at Kforce, Michael Blackman, a 25-year Kforce veteran, is the primary focal point for the firm with the Wall Street and financial communities. He is regularly sought out by leading economists for his perspectives on the economy and labor markets, and he contributes to a number of key proprietary economic publications.